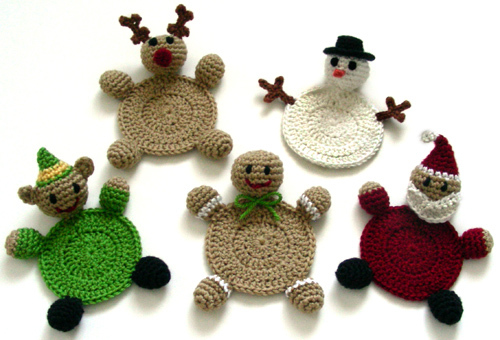 This set includes 5 different characters to crochet: elf, gingerbread man, reindeer, Santa Claus, and snowman. Each coaster is crocheted in the round and made up of small parts that are sewn together. Minor embroidery skills are required to embroider the eyes and mouths. These coasters are great for decorating the kids’ table during Christmas, but sure will put a simile on the adults too! This pattern was inspired by the previous Amigurumi Animal Coasters Crochet Pattern. Need help? If you need any help while crocheting your coasters, just let me know and I’ll be sure to help you out!! This entry was posted on Sunday, November 28th, 2010 at 5:52 PM by Rachel Choi	and is filed under Best Crochet Patterns. You can follow any responses to this entry through the RSS 2.0 feed. You can leave a response, or trackback from your own site. CUTE!!! Rachel, I just love the things you come up with, and you have the most beautiful stitch tension I have ever seen. Absolutely love this pattern. I included it in my faves on the Ravelry site so I can make some for co-workers next year. I Love these, they are so funny and cute! Hmmm, I tried one (gingerbread man), but with four rounds for the body he came out HUGE! 🙂 Anyone else? I may stop at three rounds and see how that works out. These are adorable! I’m new to crochet and completely hooked! I’m working mostly scarves right now but can’t wait to try something like this! Rachel, are yours made with cotton or acrylic yarn? I used acrylic for the ones in the photo, because it was the yarn I had on hand at the time. But you can really use either.